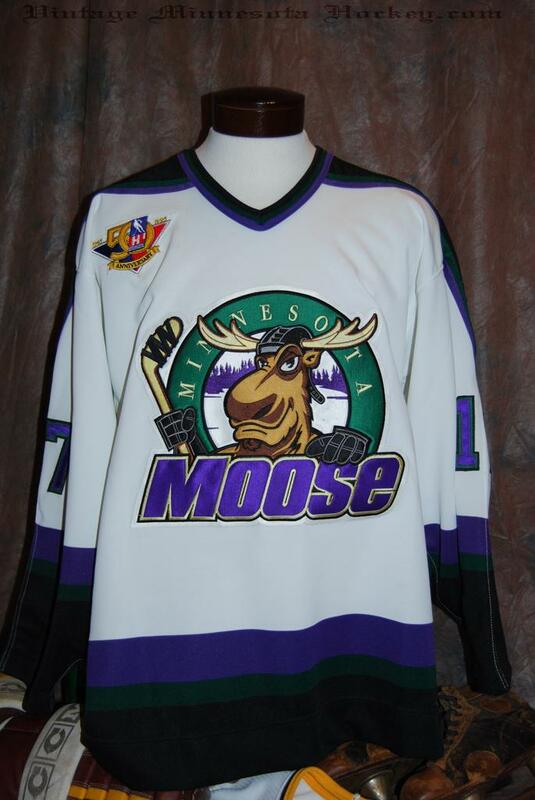 The Minnesota Moose (1994-1996) were an ice hockey team in the International Hockey League (IHL) and the first pro hockey franchise in the state since the North Stars of the NHL moved to Dallas in 1993. 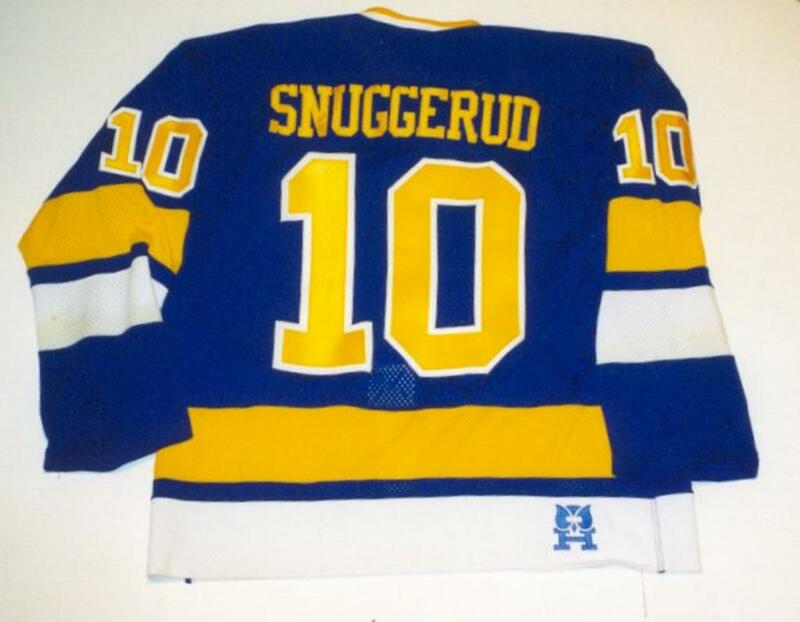 The team was named the "Moose"after the St. Paul Pioneer Press conducted a "name-the-team" contest. 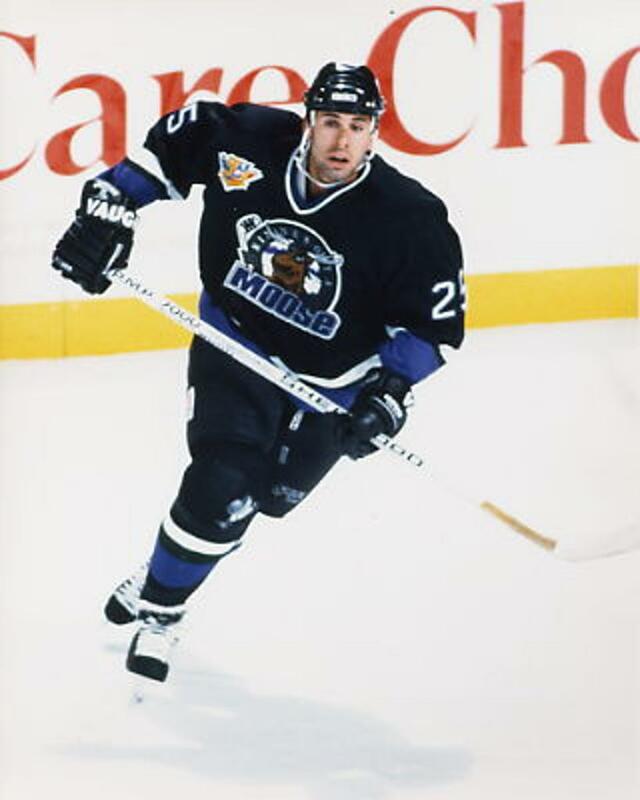 The Moose edged out the "Mustangs" in the voting and Kevin MacLean, majority owner, of the eventual Moose was quoted as saying; "The Moose is a name we can have fun with, and fun is a big part of the IHL's approach to hockey". 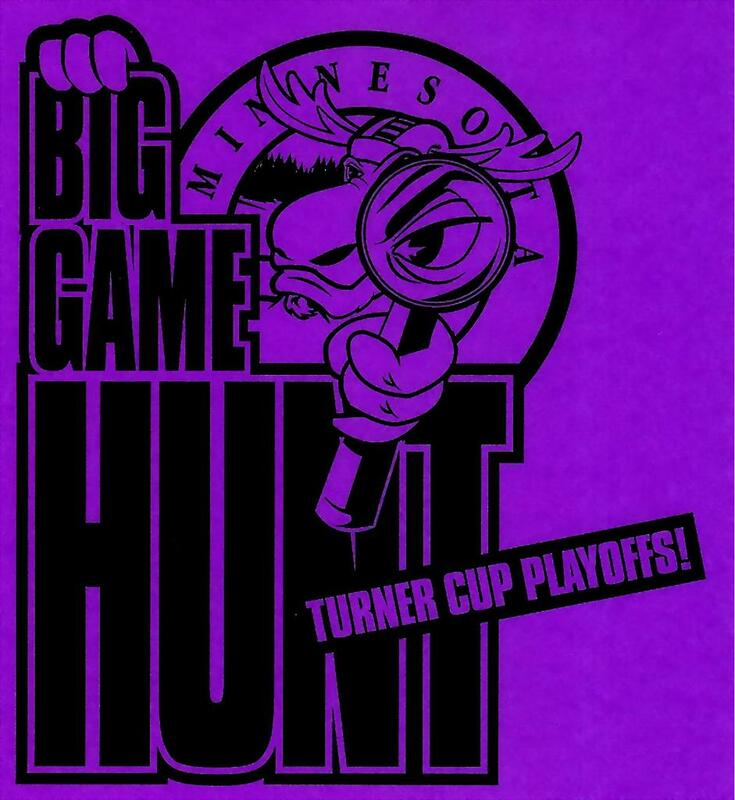 The Moose played a majority of their games at the Saint Paul Civic Center in downtown St. Paul, and also played some home games at the Target Center in Minneapolis. 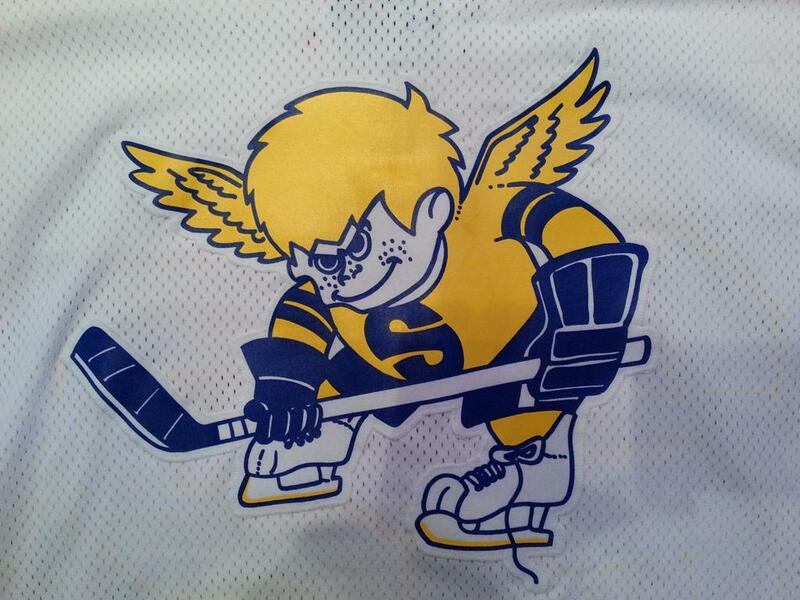 With the recently departed North Starsfollowing the 1993 season the fans were eager initially to rally behind a new pro hockey team. 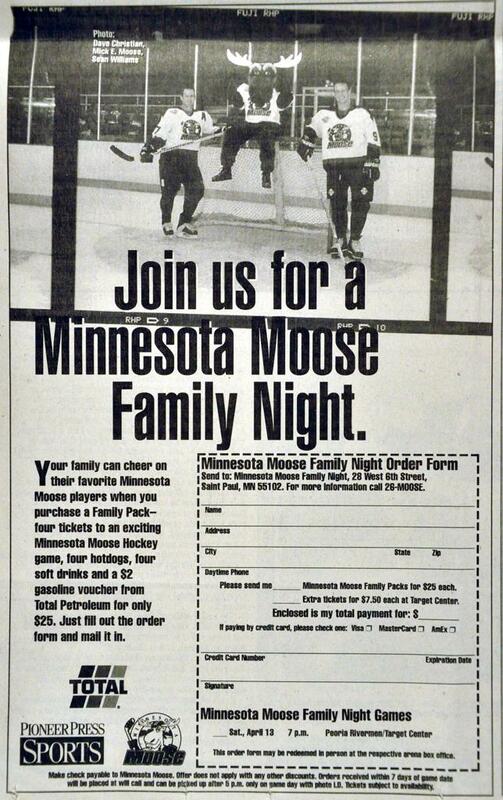 The Moose games were eventually broadcast on the old Midwest Sports Channel (MSC) after fans demanded televised games, and the stands were nearly full to capacity crowds that showed up to support the new team in town. 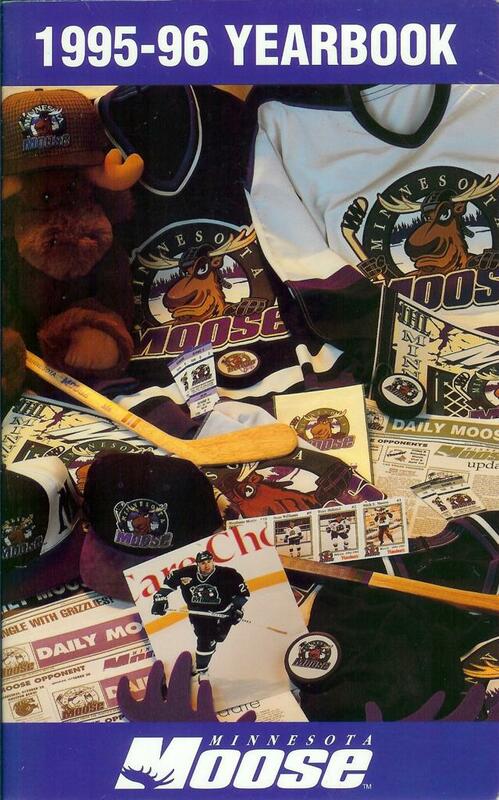 The teams "Moose Gear" and logo wear were selling at a record pace, so hot that it led all minor league hockey sales in total merchandise revenue. The Moose's first season was filled with highs and lows. 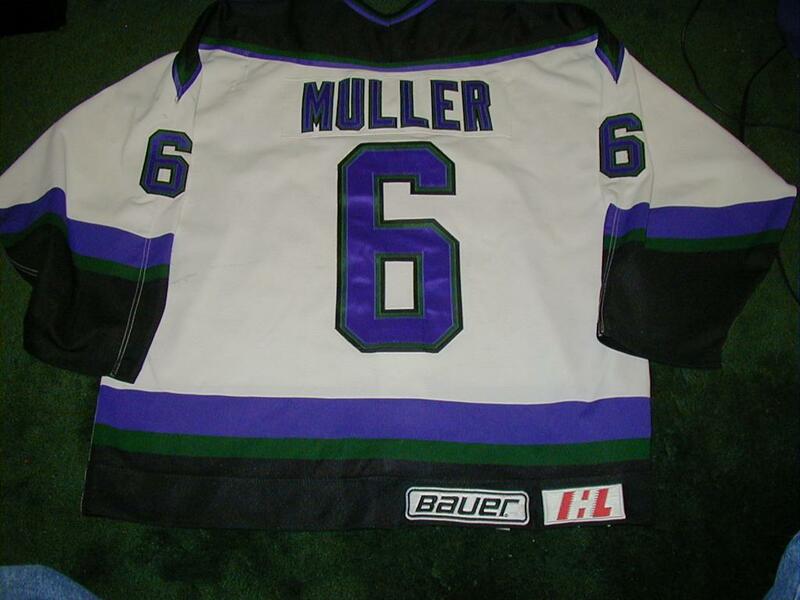 In the inagural season of 1994-95 the team finished 4th in the IHL with a record of 34-35-12. The following season the Moose signed a working agreement with the Winnipeg Jets of the NHL to become the teams minor league affiliate. 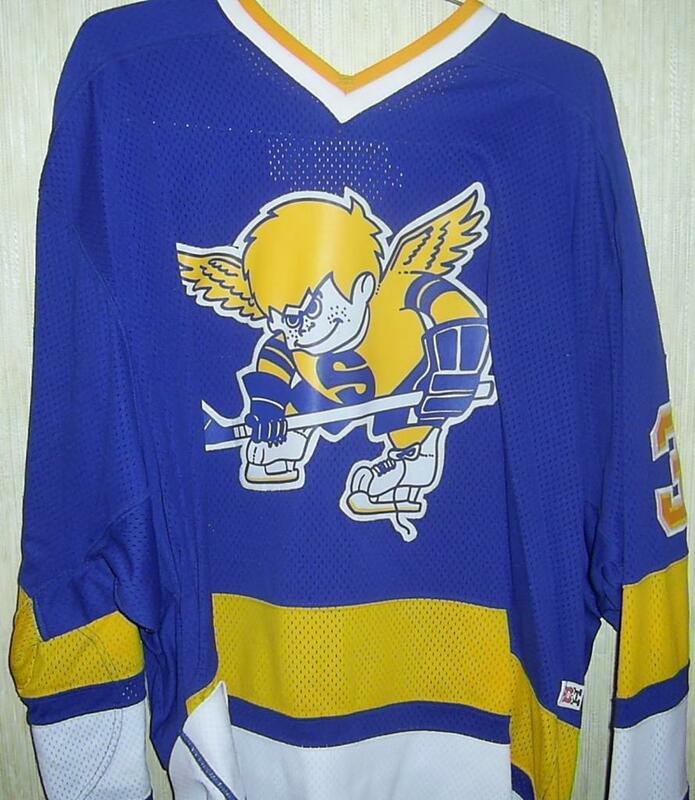 After a lackluster season performance, and finishing last in the IHL's Western Conference with a record of 30-45-7 Winnipeg became the eventual teams permanent future address, and in part due to fans not turning out for the games either the way they once did in the 1994-95 season. 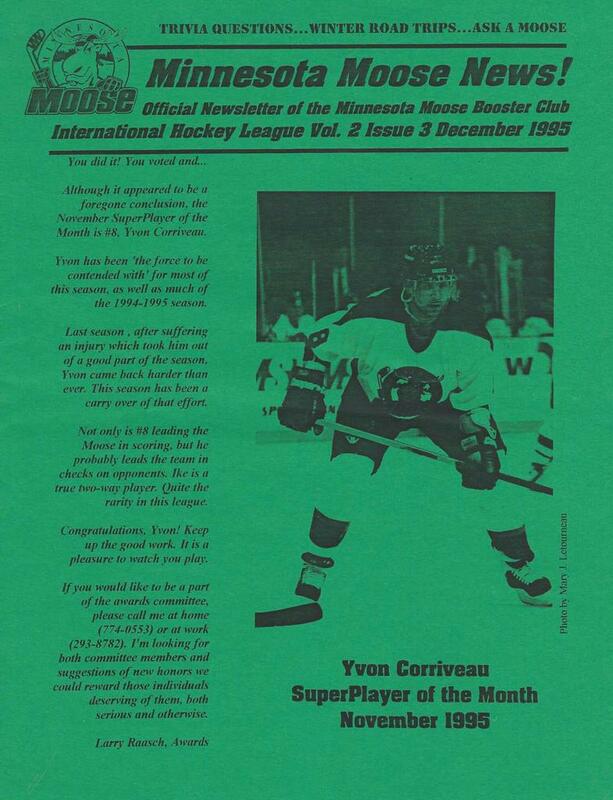 The Moose sadly left Minnesota after only two seasons to become the Manitoba Moose. It was thought at the time prior to the move the two cities would do a "swap of teams", having the Winnipeg Jets come to Minnesota and the Moose go to Manitoba. In the long of it, the Jets moved to Phoenix to become the Phoenix Coyotes and the "State-of-Hockey" was left without a pro team. 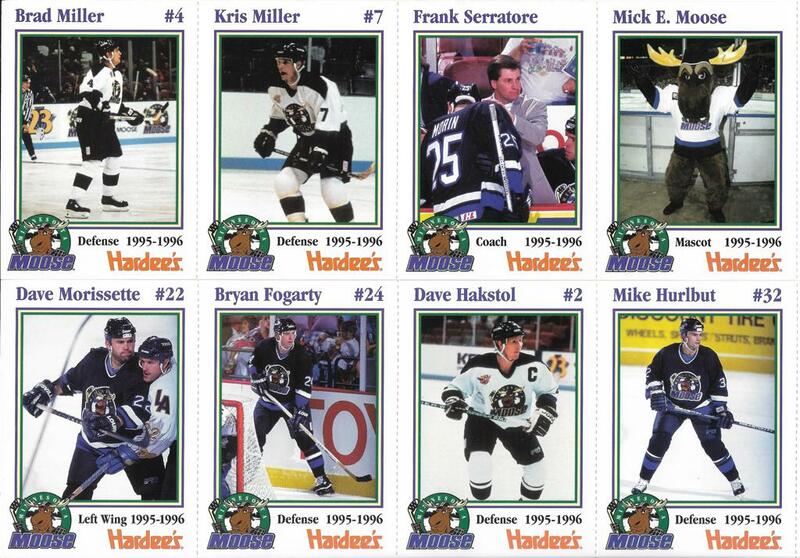 As history goes, Minnesota would eventually reclaim the Minnesota Wild 5 seasons after the Moose left town in 2000, and with it professional hockey's era was reborn in St. Paul. 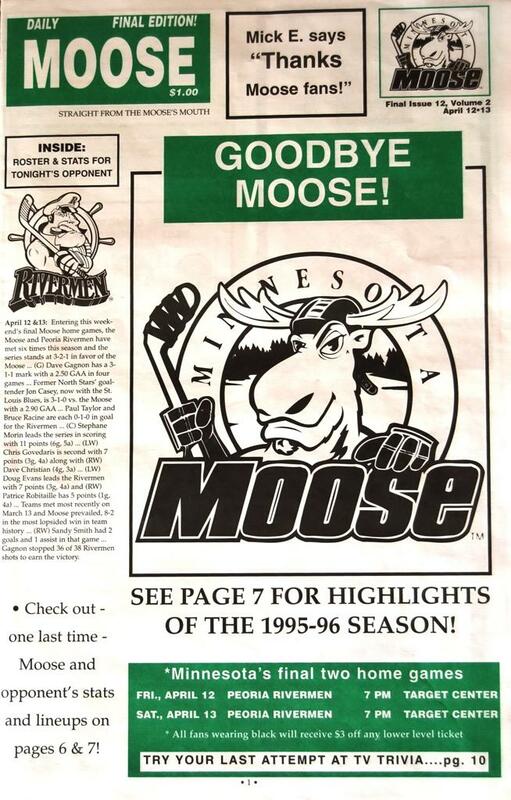 Despite only 2 seasons of the Moose in Minnesota, they were a representative of professional hockey in Minnesota at a time when the hopes of the state for recovering an NHL team had all but vanished. The IHL's eventual expansion into NHL markets continued to put a strain on relationships between the leagues. There was some speculation that the IHL would end up competing directly with the NHL, especially when a lock-out in 1994 threatened to wipe out the NHL season. However, in the 1995-96 season, the IHL's "soft" salary cap was just $1.5 million, while the lowest NHL team payroll that season was $11.4 million. 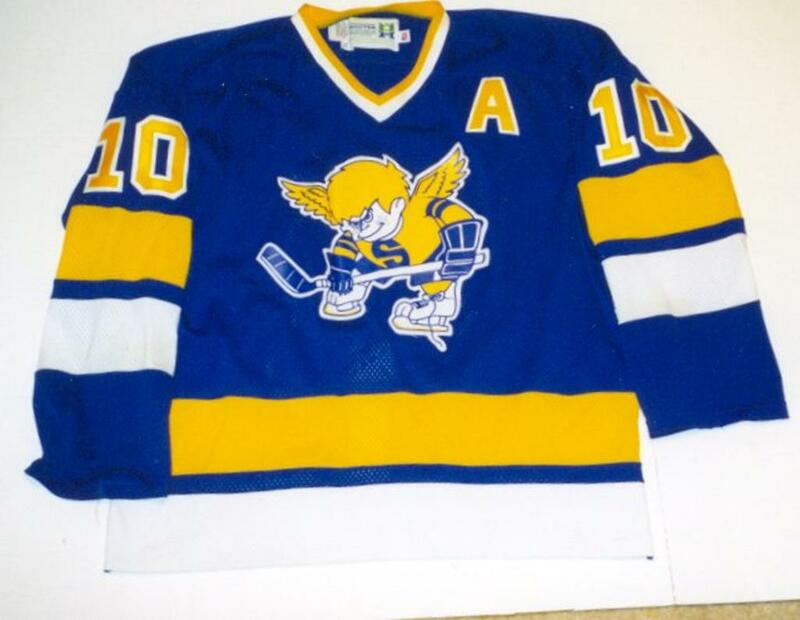 In response, many NHL clubs shifted their affiliations to the AHL. 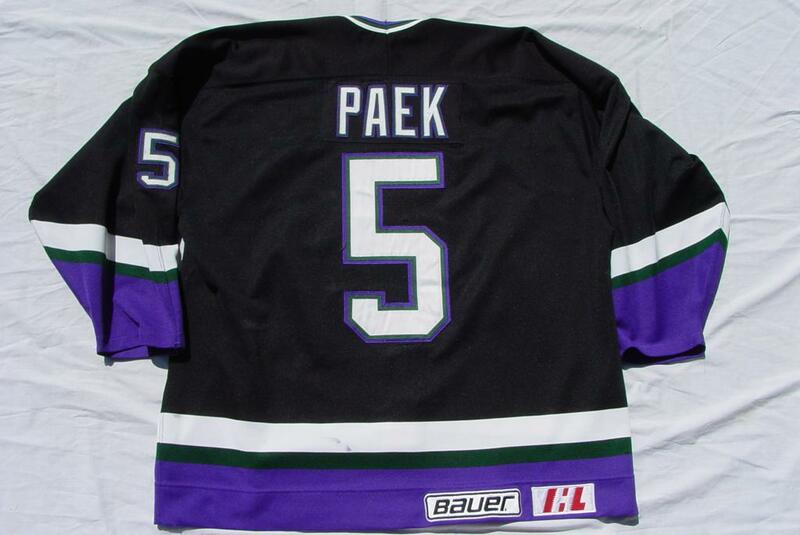 In 1997-98, only four of 18 IHL teams had NHL affiliations. With the loss of subsidized salaries, high expansion fees (by the end the league was charging as much as $8 million US for new teams), exploding travel costs and the NHL itself moving into some of its markets, the league's rapid expansion proved a critical strain, and it folded after the 2001 season. 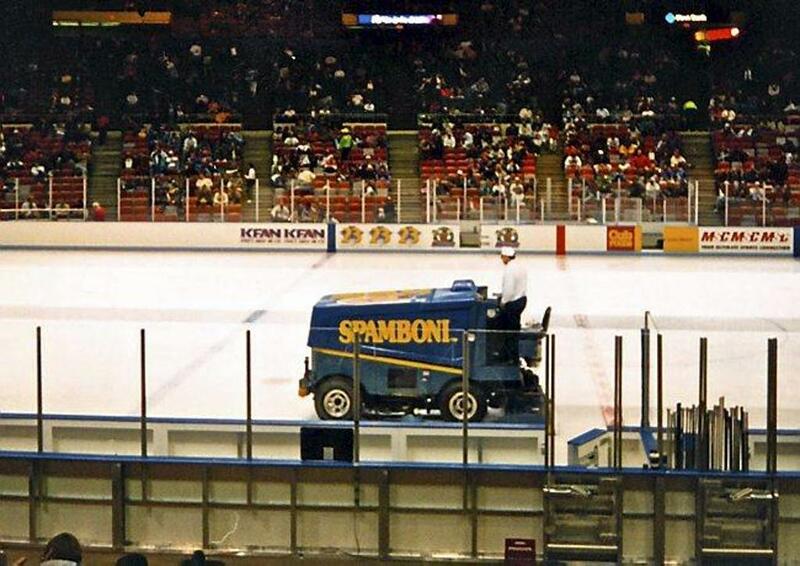 April 7, 1994 - The Saint Paul Civic Center is announced as the new home for Minnesota's IHL expansion team. A three year lease is signed with the 16,000-seat arena. April 18, 1994 - Ron Minegar is named the team's Vice President of business operations. 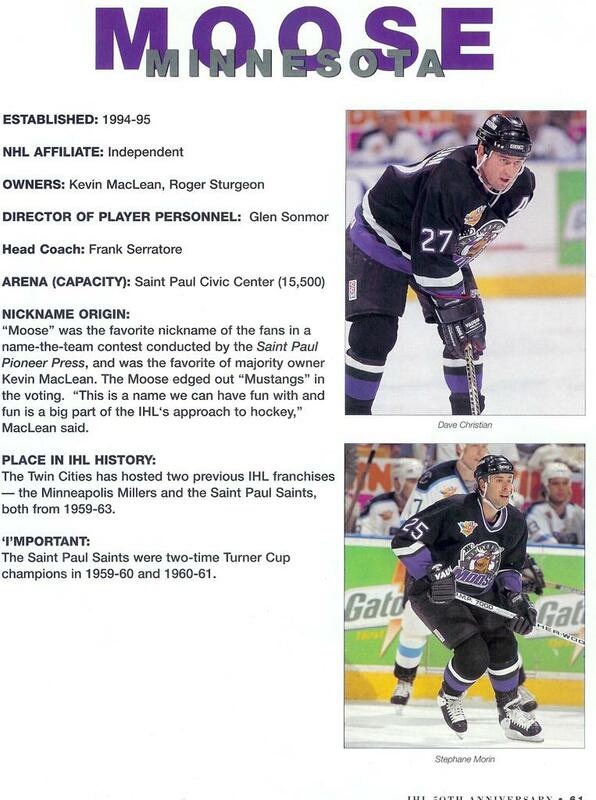 April 20, 1994 - Frank Serratore is named Head Coach and Director of Hockey Operations while Glen Sonmor is named Director of Player Development. 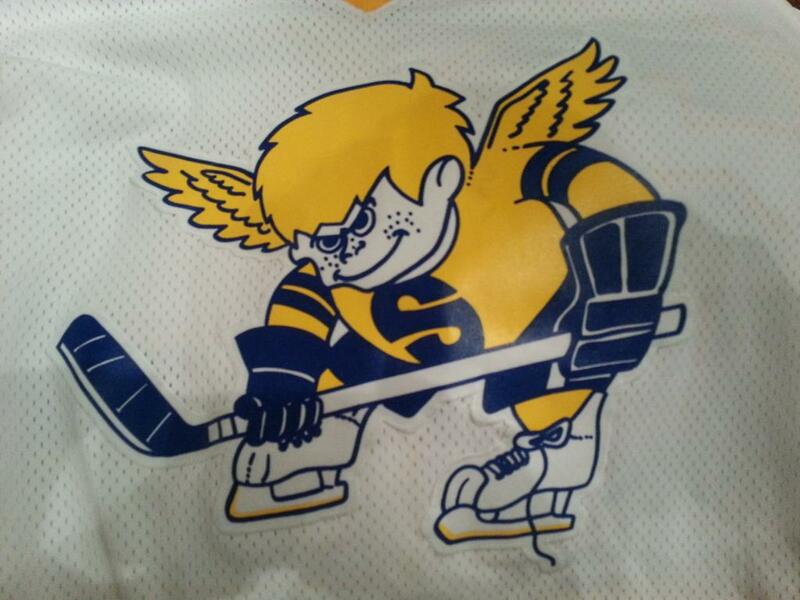 May 1, 1994 - Club kicks off "Name the IHL Team" contest, allowing fans to submit their ideas for Minnesota's new professional hockey team. 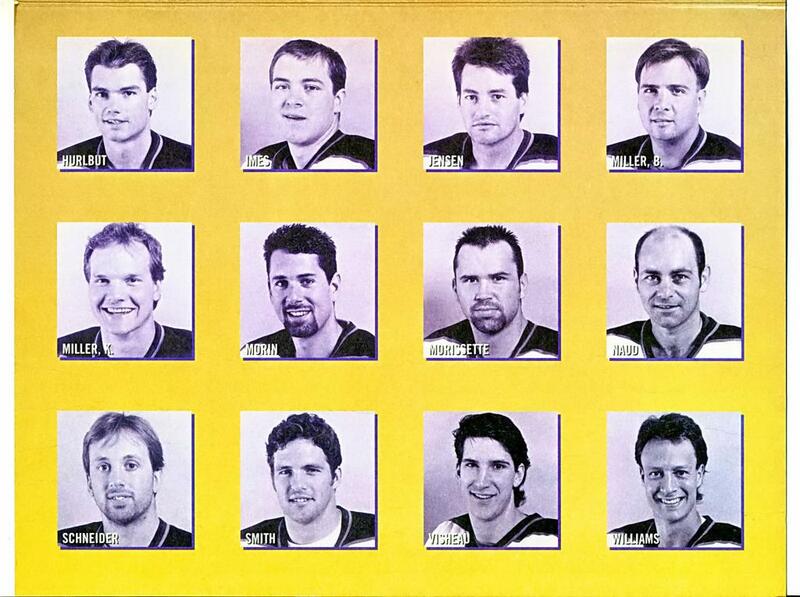 May 13, 1994 - More than 1,000 entries are received in the "Name the IHL Team" contest and the top six names are announced: Moose, Mallards, Bobcats, Tomcats, Mustangs and Wizards. Fans were asked to vote for the one they liked best. 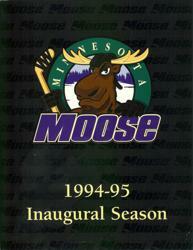 May 20, 1994 - Club officials announce that the Minnesota's IHL franchise will be known as the "Moose". Nearly 4,000 fans called in their votes, with Moose coming out on top. 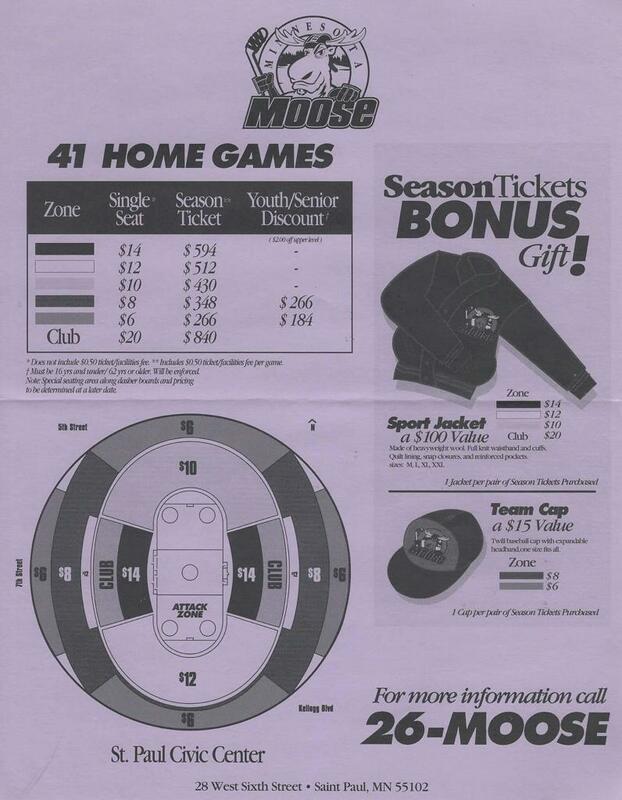 May 23, 1994 - The first Moose season ticket deposit is received. June 20, 1994 - The club moves into it's new executive offices located downtown St. Paul at (28 West 6th Street) just three blocks from the Civic Center. June 25, 1994 - Fans select their seats at the Civic Center at a Moose open house. 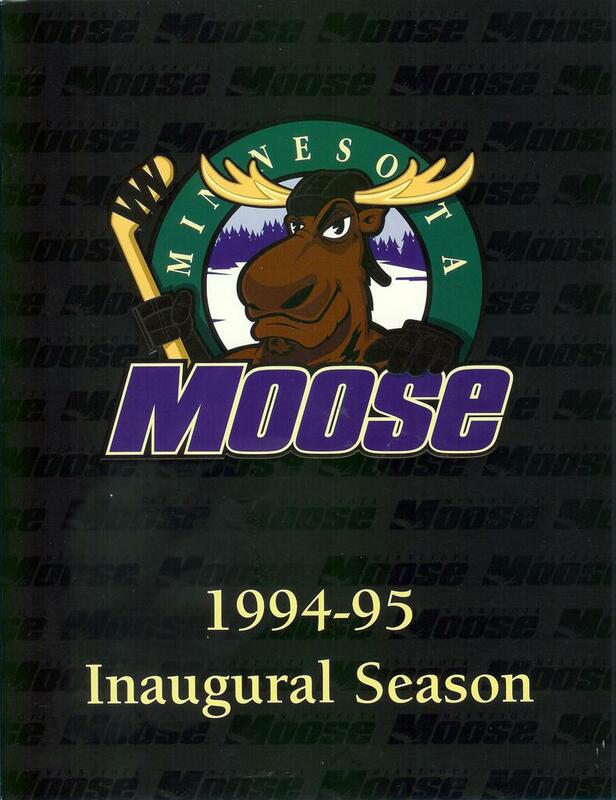 July 1, 1994 - The IHL announces that the Moose will compete in the Central Division of the Western Conference (along with Atlanta, Houston, Kansas City and Milwaukee). 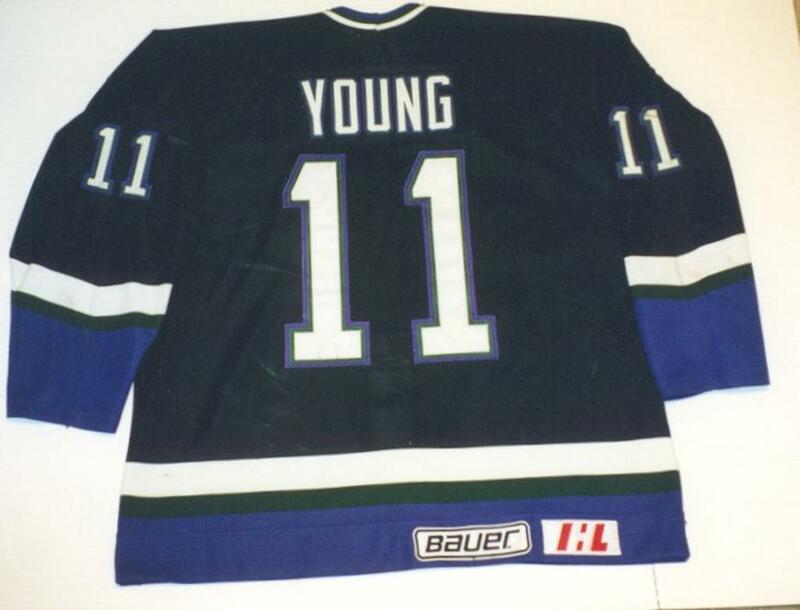 July 8, 1994 - Dave Snuggerud and John Young become the first players to sign with the Minnesota Moose. 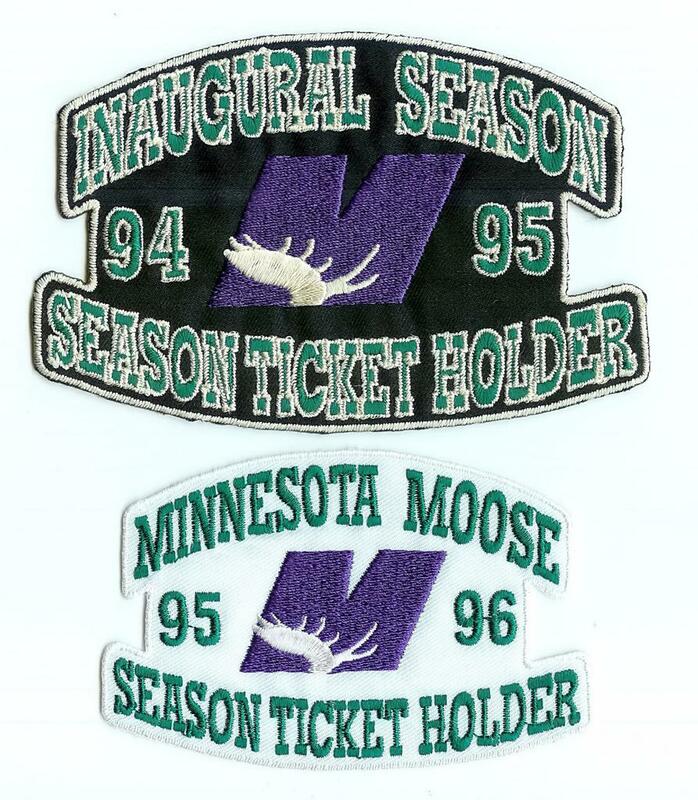 July 20, 1994 - The Moose surpass 1,000 season tickets sold. 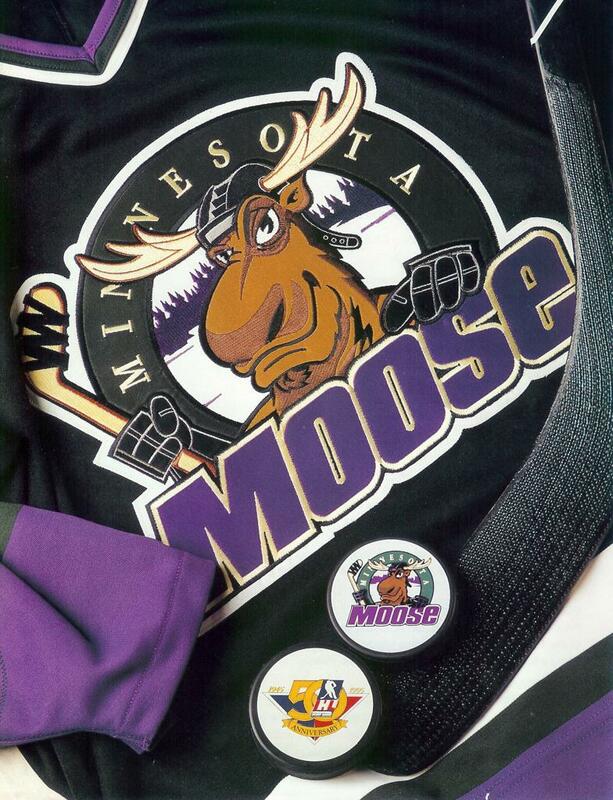 July 21, 1994 - The club enveils its logo which features a lovable yet fierce-looking Moose designed by Richard Valentine of Valentine Designs - Edina, MN. 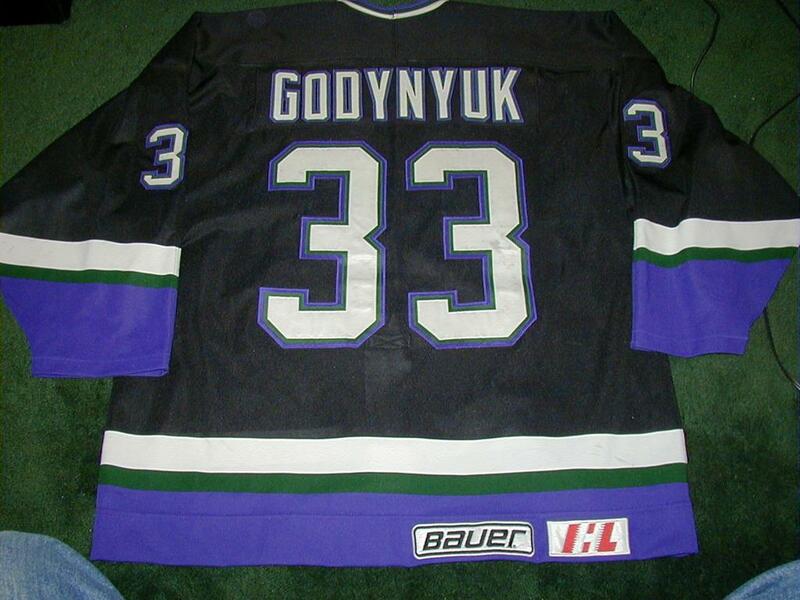 The team's primary colors were dark purple, forest green and black. 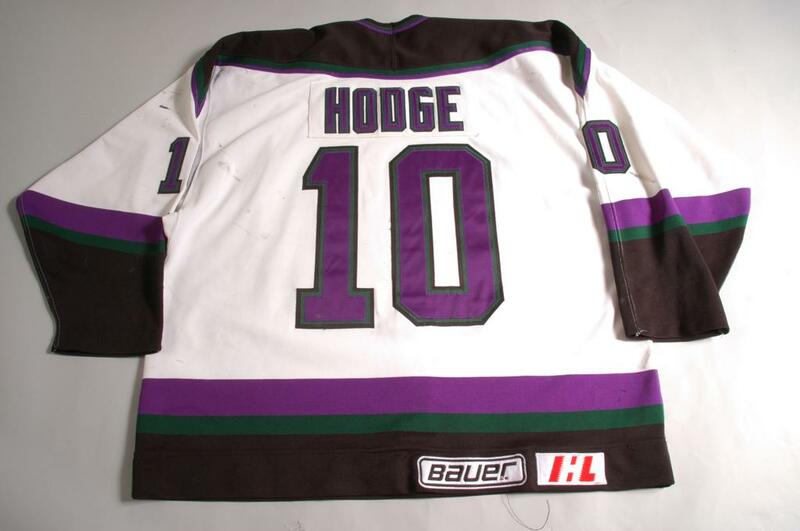 August 1, 1994 - The club signs a working agreement with the Roanoke Express of the East Coast Hockey League. 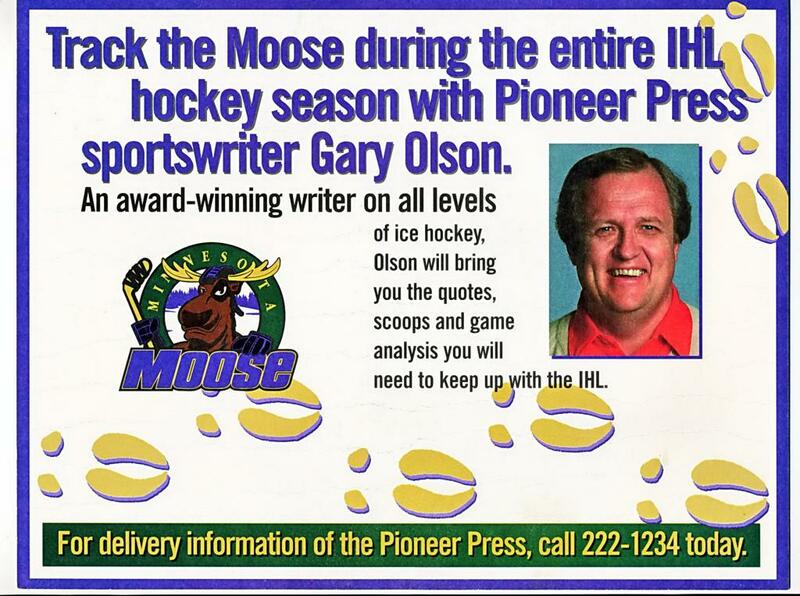 August 4, 1994 - The Moose announce the KLGTv will carry 12 games over the air. August 10, 1994 - The club announces that Midwest SportsChannel will televise a minimum of 20 regular season games. 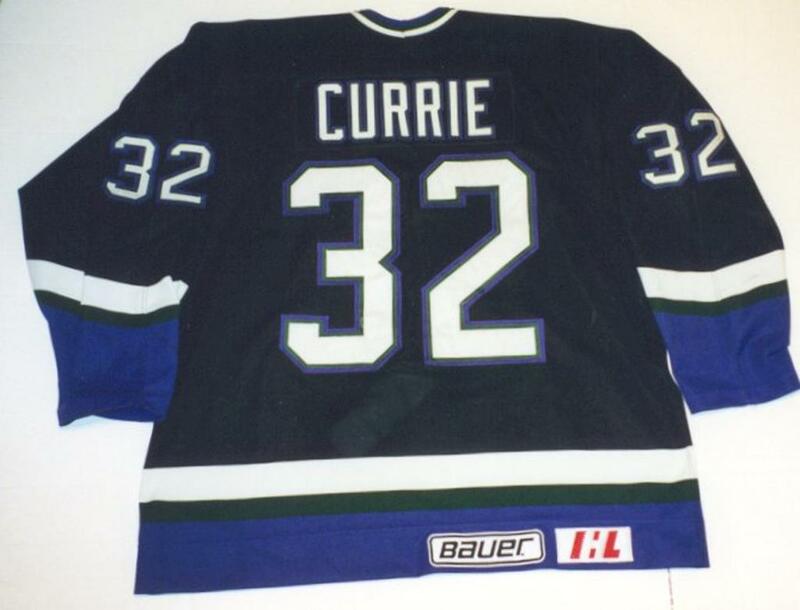 August 12, 1994 - Forty-six players take part in a Moose mini-camp. 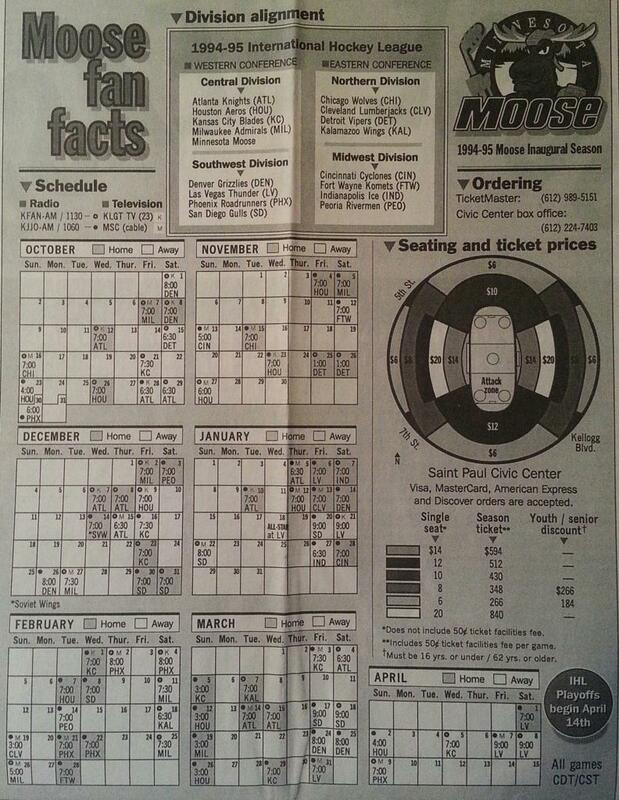 August 17, 1994 - The 1994-1995 IHL schedule is released with the Moose slated to play their first game at Denver October 1, with the home opener set for the Civic Center October 7 versus Milwaukee. September 6, 1994 - The club surpasses 2,000 season tickets sold. 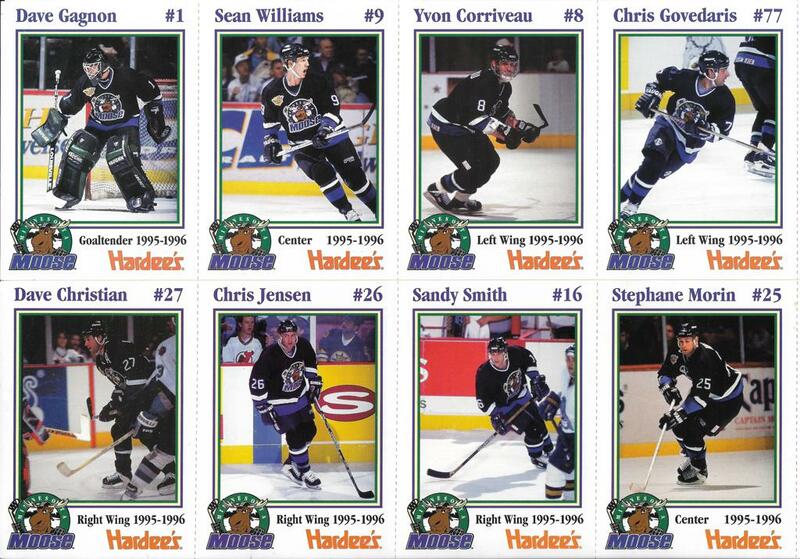 September 12, 1994 - The expansion Moose open their inaugural training camp with 35 players in uniform. 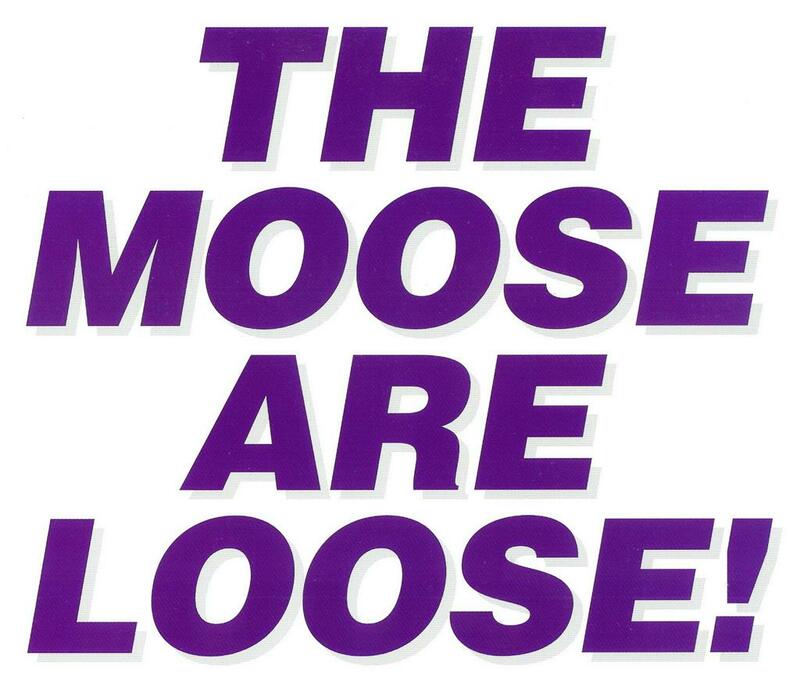 September 16, 1994 - The Moose broadcast package is finalized as KFAN-AM and KJJO-AM are announced as the club's radio partners. 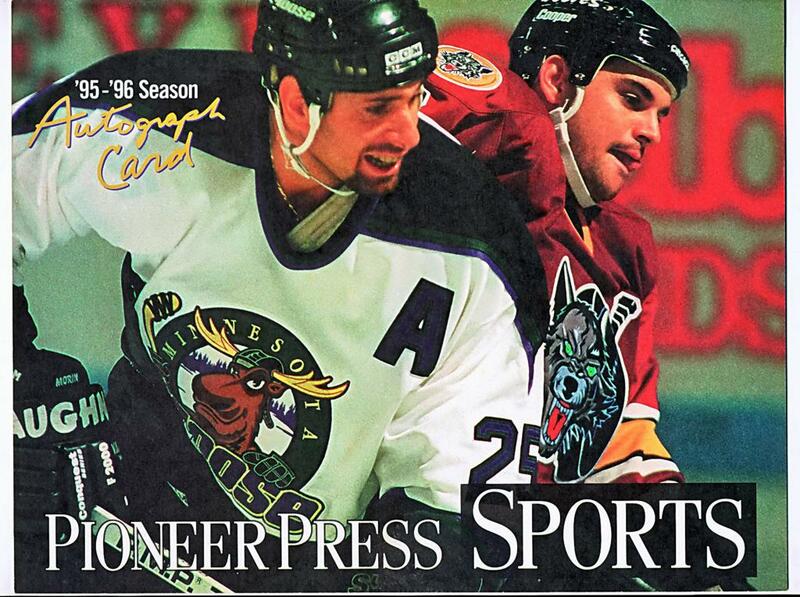 September 19, 1994 - The moose play their first pre-season game against Denver at Denver University Arena. October 1, 1994 - Blair Atecheynum scores the team's first goal in a 1-4 loss on the road in Denver. 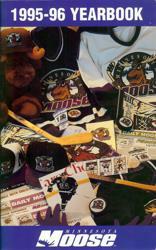 October 16, 1994 - Moose win first game after starting their inaugural season 0-5 in a 6-1 win over Chicago on the road. 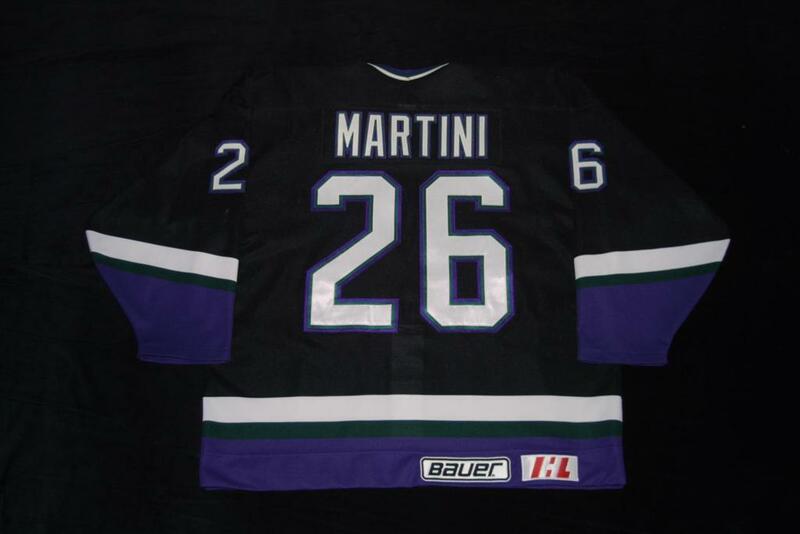 October 26, 1994 - Stephane Morin records the team's first hat-trick in a Shoot-out-loss vs. Houston in Texas. 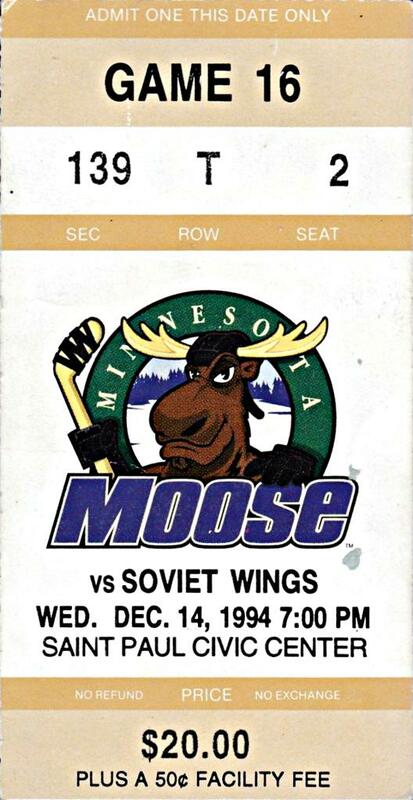 November, 11 1994 - Moose win first game at home vs Chicago with a 4-3 final score. 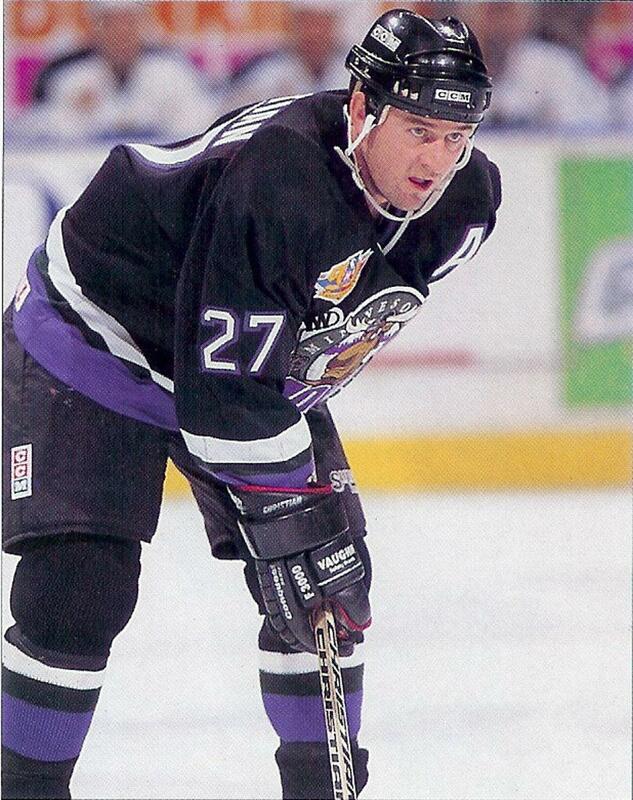 April 11, 1995 - Stephane Morin recognized as the IHL scoring champion pacing the league with 114 points and 81 assists and was runner-up to Tommy Salo as the IHL's Most Valuable Player. 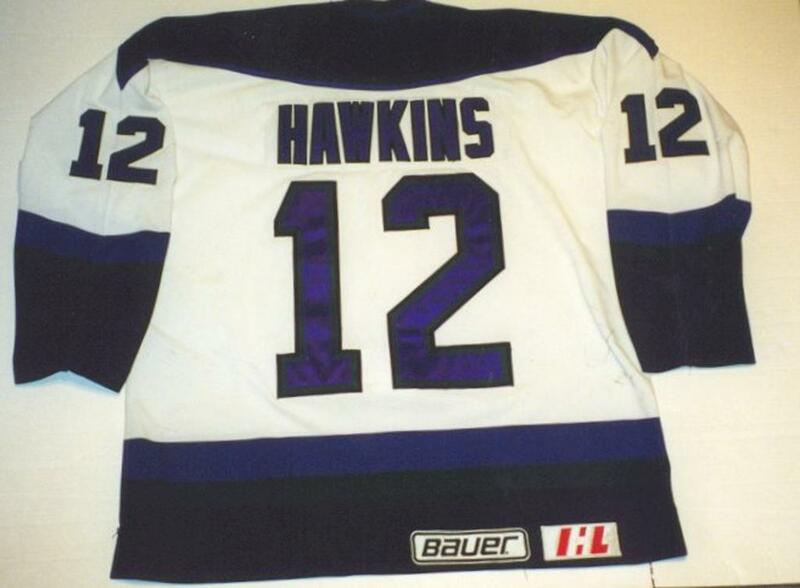 April 13, 1996 - After a lackluster season performance, and finishing last in the IHL's Western Conference with a record of 30-45-7 Winnipeg became the eventual teams permanent future address, and in part due to fans not turning out for the games the way they once did in the 1994-95 season. 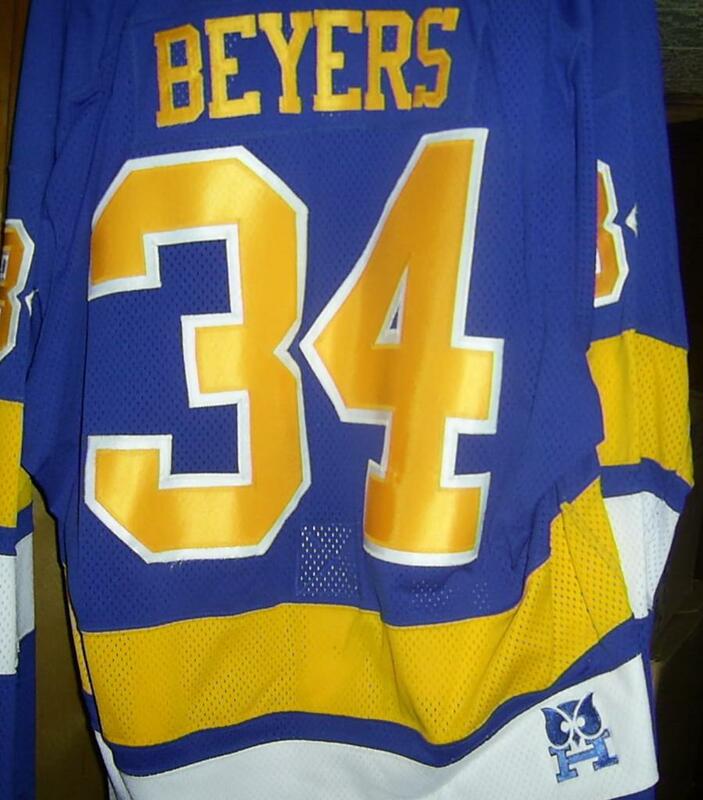 The team would move to Manitoba the following season where they still exist today.